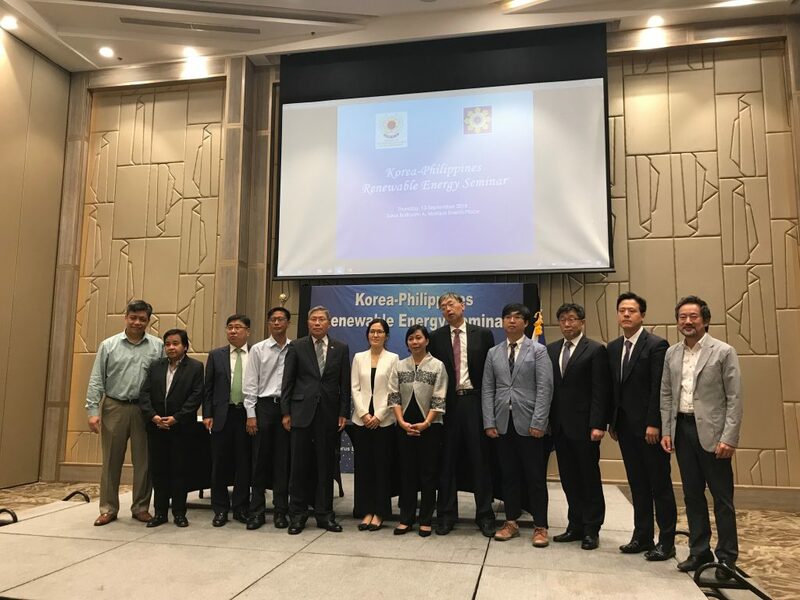 On September 13, GGGI supported the Seminar on Renewable Energy organized by the Korean Embassy in collaboration with the Department of Energy (DOE) held last at the Marquis Events Place, Bonifacio Global City, Philippines. 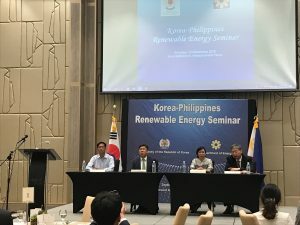 The event aims to strengthen knowledge exchange of the local regulatory and technological landscape on renewable energy and how innovative technologies and good practices in the Republic of Korea can further inform a more sustainable and competitive market for renewable energy in the Philippines. Presentations on policy mix to promote sustainable energy, as well as opportunities and challenges in the implementation of renewable energy-related initiatives were shared. Strengthening institutional mechanisms and revisiting how barriers in the energy sector may be addressed were among those identified as ways forward to promote renewable energy particularly on the application of waste-to-energy or biomass and small-scale solar power generation system in islands. GGGI provided an overview of its renewable energy-related initiatives as among its thematic focus to support member countries such as Philippines towards an economic growth that integrates climate resilience and social inclusion. Ms. Maricor Muzones, Project Lead on GGGI’s Mainstreaming Green Growth in Development Planning, showcased its sustainable energy initiatives on policy and investments in selected countries. Among the policy support initiatives featured include the operationalization of National Financing Vehicles in Vanuatu; support to the Green Fund of Mongolia; and support to countries’ greater access to renewable energy as in the case of India. On support to green investment projects, GGGI assisted the Indonesia Government in demonstrating the technical and financial feasibility of solar power and waste-to-energy development through the conduct of a pre-feasibility study on Solar Photovoltaic (PV) development in Nusa Tenggara Temur (NTT) province as a viable solution to the island’s limited access to electricity. Other investment project support shared include the Solar Demonstration Project in Mandalika, Indonesia; Fiji Solar Project on Taveuni and Ovalau Islands; Solar Irrigation Project in Mozambique; Vietnam Biomass to Energy Project; Biogas Cogeneration Project in Senegal; and Rice Husk Gasification Project in Senegal. 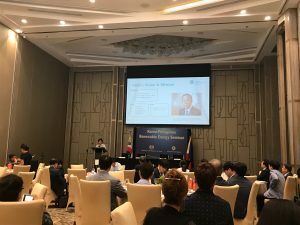 In the Philippines, sustainable energy-related initiative in the pipeline include exploring a potential support for the conduct of feasibility studies for 3 solar power projects: a) Roof Mounted Solar PVs in Oriental Mindoro; b) Solar Power Farm in Palawan; and c) 50MW Solar Farm in Bataan. Demand-driven, these initiatives in the pipeline were informed by GGGI’s current project interventions in the Philippines: a) Climate Resilient Green Growth Planning, b) Technical Support to the Operationalization of the People’s Survival Fund and c) Mainstreaming Green Growth in Development Planning. The GGGI projects in the Philippines are being implemented in partnership with key Philippine government agencies, Climate Change Commission, National Economic and Development Authority and the Department of Trade and Industry, and partner local government units.